choir croak out them goodies: The Gris Gris - Live at the Creamery. Yeah!! 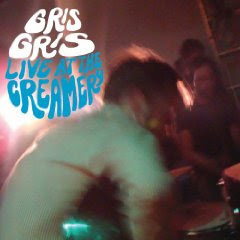 The Gris Gris - Live at the Creamery. Yeah!! For three years or so, the Gris Gris was a relatively unknown hero of a musical act, as well as what seemed the focal point of bay area label Birdman Records (were the group lacking in humility and publicized well enough to be any sort of “star,” anyway). By 2008, though, the band was done, and its brain, Greg Ashley, was to move onto a quieter place – apparently he’s now looking mostly to production for work. The band’s recorded albums – all two of them – showed influence in both Spanish classical guitar and ‘60s psychedelia. Live, however, the latter was much more apparent, and Ashley would spend a bit of time sitting with his head down until it came time to make a mess and throw his guitar into the face of an amp and create all sorts of noise. He'd save the classy stuff, the "Me Queda Um Bejou"s of his records, for his solo acoustic sets. Live at the Creamery, then, the Gris Gris’ swan song, carries much of the energy of that rowdy live show, having been recorded during a final set at Ashley’s warehouse in Oakland in April ’08. Vocal distortion is maxed out, as are Ashley’s guitar embellishments - refer here to the wonderfully indulgent solos on songs like “Year Zero” and “Everytime.” You can't make out much more than Lars Kullberg's organ, otherwise, and certainly, Oscar Michel's clarinet is lost among the fuzz. And though the album doesn’t allow you to watch an audience dance along to “Necessary Separation,” you know they were there, because (as with the album version), you, too, will get the compelling urge. Live at the Creamery nearly does justice to the live show that the Gris Gris will never again put on. I guess the blogs done? Nah. It went on hiatus for a while, while I was attending to some important junk.